Toshiba Corporation (hereinafter “Toshiba”) and the Tohoku Medical Megabank Organization at Tohoku University (hereinafter “ToMMo”) have successfully applied high-speed quantum cryptographic communications technologies developed at Toshiba and Toshiba Research Europe’s Cambridge Research Laboratory to achieve world-first quantum cryptography communication at one-month-average key distribution speeds exceeding 10 Mbps over installed optical fiber lines. The companies constructed an application for data transmission via optical fiber lines, which when combined with high-speed quantum cryptography communications technologies demonstrated practical key distribution speeds even in a real-world environment. The companies furthermore constructed and operated a wireless sensor network that continuously monitors installed fiber optic lines, and clarified the relationships between characteristic changes in optical fiber due to year-round variations in weather, vibration, and other factors and the performance characteristics of quantum cryptographic communications. This is a large advance toward the practical application of high-speed quantum cryptography communications. Details of this technology and demonstration was presented at QCrypt 2018*, held in Shanghai, China on 27–31 August 2018. In today’s IoT era, confidential information such as medical data and financial transactions are exchanged via networks, so cryptographic communications technologies require very high levels of security. In quantum cryptography communications, one bit of information is transmitted and received as a single photon of light. Eavesdropping changes the state of the photons and thus can be reliably detected. Quantum cryptography communications are therefore guaranteed to be secure against any eavesdropping and decryption, including that by quantum computers, and so are expected to be introduced into communication applications such as confidential data backups and medical data transmissions, etc. However, practical applications incorporating quantum cryptography communication will require development of systems that incorporate existing data communications infrastructure using optical fiber lines, as well as demonstrations that such systems can stably operate over long periods of time. In a joint research project, Toshiba and ToMMo have applied high-speed quantum cryptographic communications technologies developed at Toshiba and Toshiba Research Europe’s Cambridge Research Laboratory to develop a system that has been introduced into applications that transmit genome analysis data and to perform field demonstration experiments. 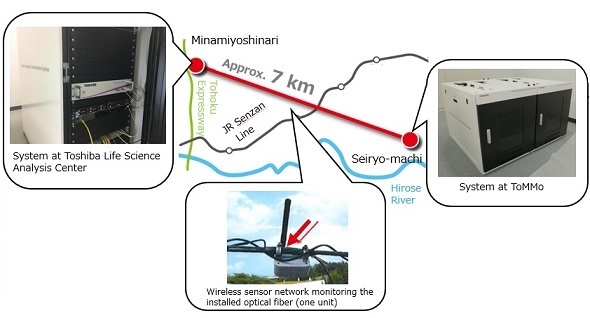 In these experiments, quantum cryptographic devices were introduced at the Toshiba Life Science Analysis Center (Minamiyoshinari, Aoba-ku, Sendai) and at ToMMo (Seiryo-machi, Aoba-ku, Sendai), and communications were performed over dedicated installed optical fiber lines between the sites, a distance of approximately 7 km. *An annual international conference for quantum cryptography researchers. The 8th International Conference on Quantum Cryptography (QCrypt 2018, http://2018.qcrypt.net/) was held on 27–31 August 2018 at the Shanghai International Conference Center in Shanghai, China, hosted by the University of Science and Technology of China.